When you use a beautiful device like a DCN28, you have to try to use all the advantages it can give you. I had already used the DCN23 extensively, so I knew some of the major advantages of active filtering. One of the new advantages of the DCN28 I did not expect, was the added precision you get by using the new software. It is much easier to design, test and try your filters. Active filtering has a lots of advantages over passive filtering. Some things you cannot do with passive filtering, like creating a time delay between speakers. Another thing is adjusting for errors created by standing waves. This set-up uses both these advantages. Some things you can do with passive filtering, but are much easier with active filtering. Like 48DB filtering, baffle step compensation etc. My current set is designed to take the most out of active filtering. I originally started this installation as a 4-way speaker system. But I ended up with a two-way system and two separate woofers. The woofers were designed as a mix between woofers and sub-woofers. They are usable up to 500Hz. Sound-wise they turned out much better at higher frequencies than the smaller side -woofers I had in my old speakers, so I also re-designed new main speakers without basses. The woofers are now optimized for their location in the corners. There they induce standing waves a bit less, and have a much wider sweat spot (in front of the wall on the other side of the room). Further more they have a higher output because of the room-gain on that location. Right now they are filtered on 200Hz. 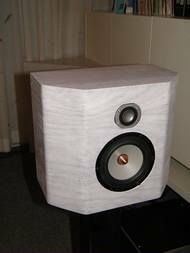 The main speakers are time-delayed with the woofers to get a good integration. Both speakers are measured separately to the sweat spot. My room is not symmetrical. 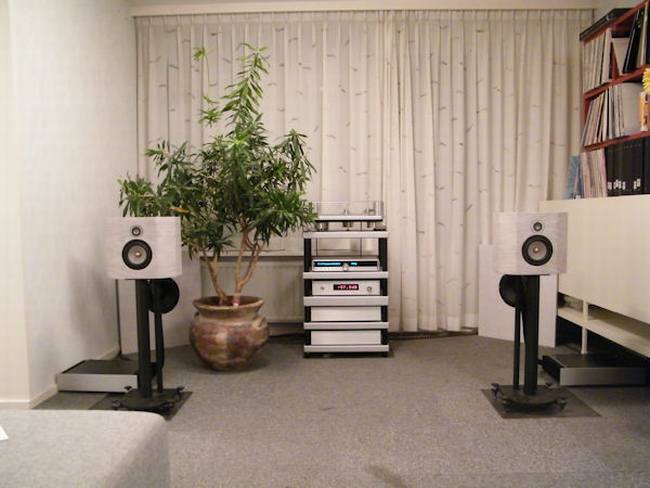 The main speakers are on equidistance, but I have a 20cm differences with the woofers. You can clearly hear a difference when you do not compensate in the filtering for that small distance. The main speakers look a bit weird. They have an extra large baffle. This is deliberate. You can always use the DCN28 to adjust for the baffle step, but one thing Robert has not been able to improve: changing the power output from the drivers on different angles! The wider baffle moves the baffle step down, it now integrates with the high pass filtering. The baffle also helps to decrease dispersion evenly from low to high, over the whole frequency band. The effect of this is that you have a wide sweet spot, so all along the room you can at least hear real music! 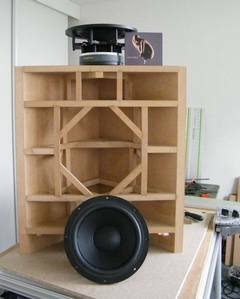 The woofer is a 45L closed box, with a custom made 10 inch woofer from audiotechnology (10 B 77 25 10 KAP). A perfect adjusted driver. When you use a small closed box, and a speaker designed for an Fs of 18Hz you always end up with a low output. But the location in the corner adds an extra 6DB, just 1 DB under the output of the mid. This leaves me a lot of headroom to play with. I wanted to use that for extending the low roll-off. Nearfield I can get the woofer down to a flat 20Hz with help of the DCN28. But I do not need to do that in my set-up, because the room-gain is such that without any bass-boost I already get good results down to 20Hz anyway. The headroom is used play with around the dips that occur from the standing waves. Together with the notches I get a fairly flat response over the complete bass-range on any location on my couch! This took a lot of listening to get right. Like always, a flat measured line does not mean good music. The mid is a Seas Excel W15CH001. A great mid, used here between 200Hz to 2500 Hz. You can take it a lot lower actually. 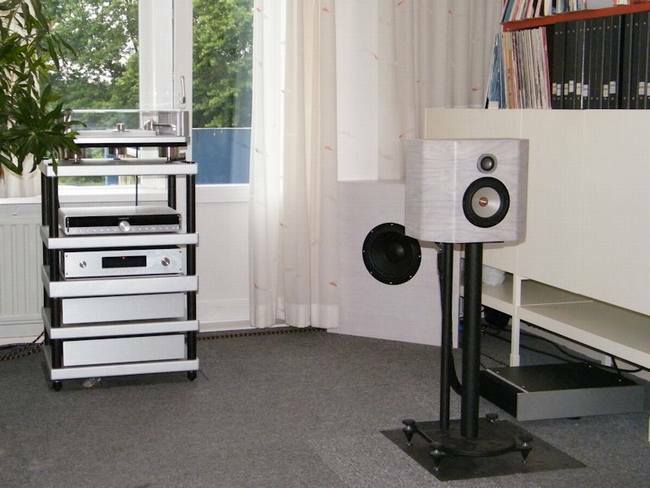 The tweeter is the famous Focal Beryllium tweeter. I do not think any introduction is needed on these drivers. The DCN28 plays an important part in the set-up. The differences with the DCN23 is actually silence. The digital inputs, the integration with the pre-amp facilities, better electronics and of course the balanced outputs all help to lower the distortion. You can go a long way with the DCN23, and other active filters. Only the end result will not completely reach the actual sound results of the DCN28. The filtering in the current set-up is minimized. It is used for delays, and high-passes and low-passes. The mid only has a 0,4 DB roll-off to get it flat, and notches for the cone breakup. The high has two notches. The low has several notches and gains around the room frequencies. I am still optimizing. Easy to do, with help of four pre-sets.